Catch fish – not lines or cables! If you’re fishing near transmission lines, be careful when you’re casting! Casting can result in the fishing line coming into contact with the transmission conductors overhead, and becoming a conductor itself. Our lines are high voltage, which means that even if your line doesn’t touch ours, it could still act as a conductor if it gets close. Look up! Whether you’re a recreational boatie, a professional sailor, or a commercial fisher – it’s important to stay aware of overhead lines. When near transmission lines, take care not to let your mast or any aerials come close to overhead lines. You’ll need to exercise the same care when towing your boat on land – look up and know where the lines are. As a rule, keep your boat and aerials at least 4 metres away from the lines at all times. Where transmission lines cross navigable lakes or rivers, conductor heights are often specifically increased as an extra safety precaution. However, it’s still important to remain vigilant especially when boats navigate close to the mid-span low point in the lines. There is a Cable Protection Zone (CPZ) in Cook Strait, where Transpower’s submarine power and fibre-optic telecommunications cables lie on the seabed. 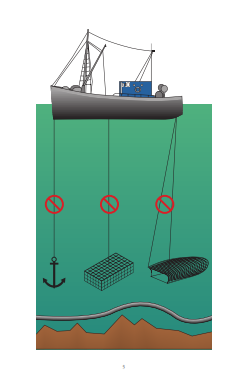 FOR ANY VESSEL OF ANY SIZE, FISHING AND ANCHORING ARE ILLEGAL WITHIN THE CPZ. We urge all boat users to pay attention to the protected areas and be mindful of the rules when in a CPZ. Protecting these cables is in everyone's best interests.